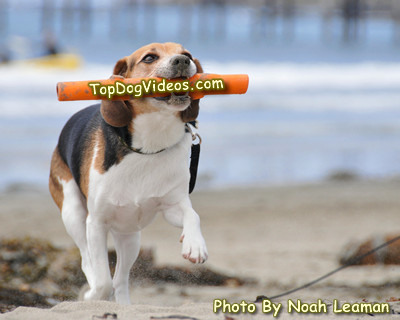 Beagle videos - Top Dog Videos – Some of the most watched and highest rated dog videos on the web! How many tennis balls can fit inside the mouth of a Beagle? The modern Beagle is a small to medium sized dog developed around the 1830’s in Great Britain and are historically foot-hounds, with packs of Beagles known as ‘crys’ being used for hunting hares and rabbits. Like a lot of other working dogs Beagles today are more likely to be found in a domestic setting sniffing out a treat, rather than hunting, but their keen sense of smell and tracking instinct still finds them employed around the world as detection dogs. And their small build and gentle disposition also makes them good therapy dogs.